You are here: Home / TRAVELS DESTINATIONS / CENTRAL VISAYAS DESTINATIONS / BOHOL / Bohol’s Chocolate Hills: Stairs and Jumpshots! 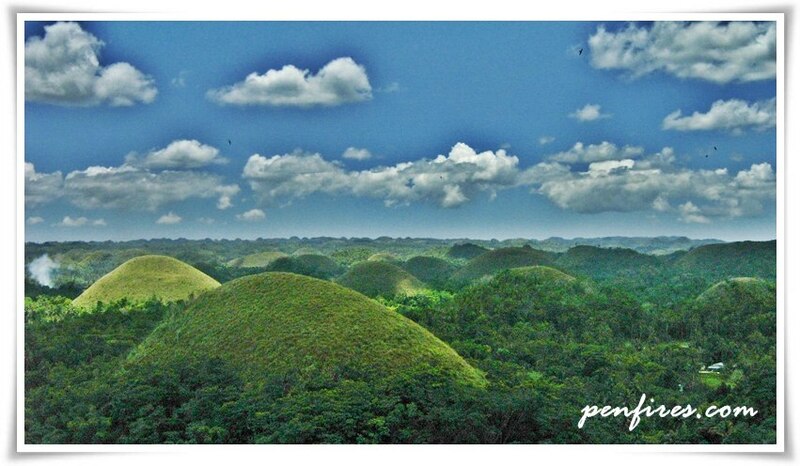 Bohol is synonymous to Chocolate Hills. Elementary students learned early on about the major Philippines tourist attractions that the country offers during history classes, and i think no kid will forget about Bohol Chocolate Hills simply because any phrase with ‘chocolate’ in it is bound to be remembered. Or at least that’s my opinion hehhehe. The Chocolate Hills of Bohol are such a unique geological occurrence that Filipinos or even foreigners familiar with world wonders will definitely recognized these 1,200++ majestic hills dotting the town of Carmen in Bohol for what they are – the famous Chocolate Hills. They are perfectly formed cone-shaped hills and similar in sizes. These hills are lush green during rainy season that turns brown when summer starts. During summer these natural wonders resembles that of yummy chocolates, that’s how the name ‘chocolate hills’ evolved. No tour to Bohol is complete without visiting the Chocolate Hills complex. This is my most favorite spot in all of Bohol I swear! Why? The hills are perfect backdrop for pictures hehehe. To reach the viewing deck you have to climb 214 steps but no worries for there are rest areas along the way, which i put to good use as i was constantly resting and catching my breath. Climbing those steps on a hot, humid summer day is a challenge for a couch potato like me. NO wonder then that i was the last one in our group to arrived on the deck lol. Entrance fee to the Chocolate Hills Complex is P50 per person. You have to climb all these 214 steps to the top! Sama ka ke Mau punta siya Cebu go na!